The leather Minnesota fringe handbag above has an early 70s feel - perfect with long hair and a paisley shirt and the warm colour and suede texture give it an authentic frontier feel. Minnesota have been making American style bags since 1945, so they've had plenty of time to get it right. 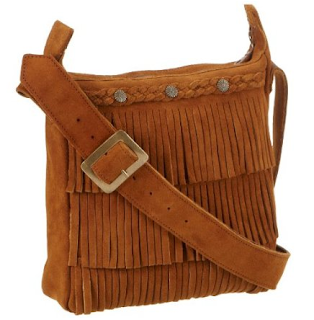 Fringed bags have been spotted on the city streets of Europe since last year, having become somewhat Boho chic - sometimes with super long fringes that look like a trip hazard. However, this one is understated and sturdy.